It was a boring afternoon in February one day when I sat down thinking of ways to kill sometime. I was going through various CAT interviews and hence the thing on top of my mind was what managers do. They try and involve themselves with intellectual things, like reading business magazines and writing blogs. I had a few seniors who had impressed me with their writing skills and I had always thought that it came from their habit of writing. So, I chose this as my way to kill time and promised myself that I would maintain this habit. Though, I was sure that it won’t last any longer than my other so called endeavors which take the backseat as soon as there are other pressures seeking time and effort. Amidst these conflicting thoughts I laid the foundation of my blog – Expressions by KT. Well why this name? a genuine question. I did spend a few moments when the blogger site prompted me to choose the name. I thought of what I could write about and I was blank on it so the name had to be topic agnostic. I should be able to post on anything and everything and hence it was nothing but just what I wanted to write. So it was going to be a medium of expressing what I knew, felt, or experienced. And so came the name!! I wrote for a week and then for another week. All I was waiting for was when I would be bored of this and would stop writing and this corner of internet would soon die its own natural death. However gradually I grew fondness of this blog and I started writing more and more. Soon, I would find myself thinking of words on how to express what I was witnessing or deciding topics for my new article. Though there were patches when the blog took a back seat but somehow or the other it bounced back to its place. And thus as time passed, articles kept accumulating and blog kept growing. Every such endeavor lives life in milestones, striving for another when one is achieved and aiming higher with every success. Today, it is indeed a special day. 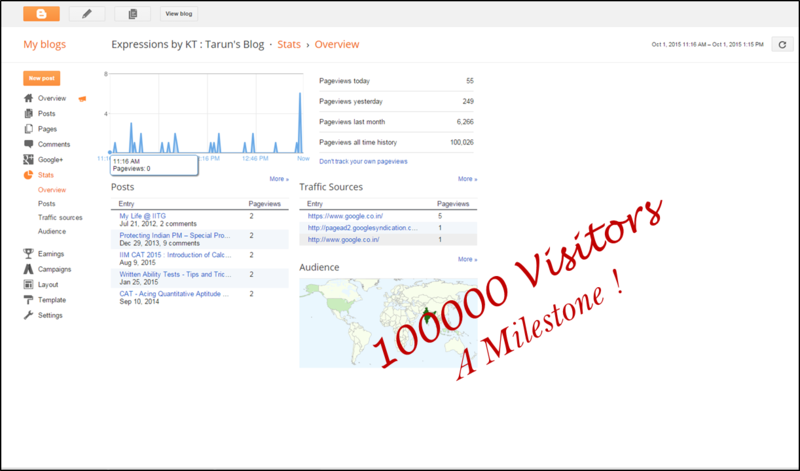 The blog crossed 1 Lakh visits on its pages and it is indeed time to rejoice. Over last month itself visitors from 360 cities from over 65 countries do tell that the blog is getting traction gradually. All those articles I kept minting in solace did find someone or the other who was willing to spend some of their precious moments reading through them. This is nothing but just a fate which makes me more committed to this small world in itself and a resolve to continue taking this blog to greater heights is simply strengthened. Hope, if you are reading through this, you are already a regular reader of the blog. If not, try spending some time on some of the popular articles and you may find a reason to follow some of what I say. Time for me to celebrate this fate and I would now get ready to get out for a quite coffee at some of the corner joint in Connaught Place. A new article would be coming out soon. Till then enjoy all that is already there.